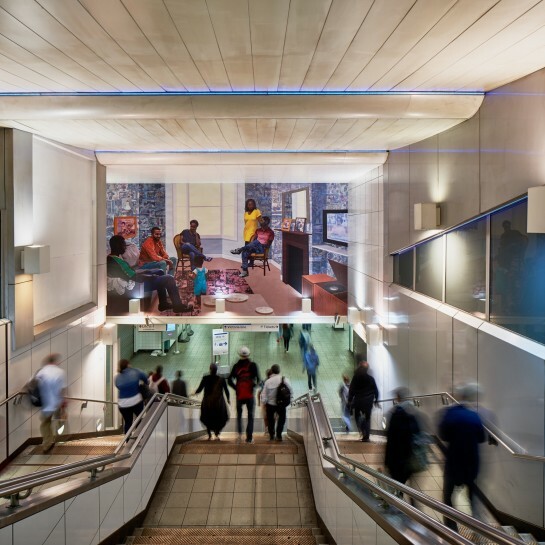 'Remain, Thriving', unveiled on 20 September 2018, is the first commission in a new programme at Brixton station and will be on view for six months. Remain, Thriving is a new work made specifically for the entrance of Brixton Underground station. The work depicts an imagined domestic scene, a theme predominant in much of the artist’s work, of an informal gathering of grandchildren and great grandchildren of the Windrush generation in a fictional home in Brixton. The space contains a number of vestiges of an earlier generation, such as a doily or record player, which the figures might have inherited from their parents or grandparents. The programme at Brixton takes the numerous murals that were created in Brixton during the 1980s as an initial point of departure and invites selected artists to respond to their diverse narratives, the rapid development of the area and the wider social and political history of mural making.